Cast: Lee Dong Gun, Lee Yoo Ri, Lee Ra, Seo Joon Young and Seo Ye Ji. Cha Mi Rae (Lee Yoo Ri) is a single mother and doctor aiming to become a chief, in order to make life better for her daughter Sa Rang (Lee Ra) and herself. Having a strong and dominant personality, Mi Rae makes sure that no man can come close to her, even with her friend and hoobae Shin Woo Hyun (Seo Jun Young) trying to woo her. Mi Rae believes that no matter what, if it isn’t 100% it’s not worth it, which also is the way she bring up her daughter. Her entire life is turned upside down when she one afternoon passes out on the bathroom floor. She is diagnosed with terminal cancer, which will only give her few months to live. Now her daughter will be without a parent, so she decides to try and find her ex-boyfriend whom she believes would be the best father, Han Yeol (Lee Dong Gun). Han Yeol is a former baseball player who has become a rehabilitation coach for that same team. Filled with anger over Mi Rae leaving him years ago and breaking his heart, he has become a rather dull person. I for some reason like Lee Dong Gun, but I have no idea why. I thought it was because of a drama from before, but I really don’t have any drama of his that I am fond of. Anyhow, this drama is quite good, though it has some of the typical Korean clichés, it really is very funny. Also it is very interesting as it is good. I mean the story is quite typical and so is the buildup, but nevertheless the drama is charming. Lee Dong Gun and Lee Yu Ri are great together, though the chemistry felt a bit forced. The little Lee Ra was quite adorable, so no complaints there. I really liked the supporting actress Seo Ye Ji, but I dunno why: she was just kind of likable. 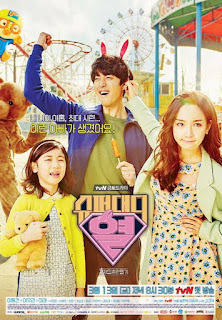 Well to sum up: a cute and nice drama, with a bit of comedy and romance.